This article is about the mobile computers company, Psion PLC. For other uses, see Psion (disambiguation). Psion was a designer and manufacturer of mobile handheld computers for commercial and industrial applications. The company was headquartered in London, England with major operations in Mississauga, Ontario, Canada and additional company offices in Europe, the United States, Asia, Latin America, and the Middle East. It was a public company listed on the London Stock Exchange (LSE: PON) and was once a constituent of the FTSE 100 Index. Psion's operational business was formed in September 2000 from a merger of Psion and Canadian-based Teklogix Inc. and was a global provider of solutions for mobile computing and wireless data collection. The Group's products and services include rugged mobile hardware, secure wireless networks, robust software, professional services and support programs. Psion works with its clients in the area of new and emerging technologies including image capture, voice recognition and RFID. Psion has customers in more than 80 countries around the world, as well as operations in 14 countries. Formed in 1980, Psion achieved its first successes as a consumer hardware company that developed the revolutionary Psion Organiser as well as a whole range of more advanced, clamshell-design Personal Digital Assistants. Psion closed, or disposed of, all its previous operations and is now focused on rugged mobile computing solutions. It withdrew from the consumer devices marketplace in 2001. It was announced on 15 June 2012 that Motorola Solutions had agreed to buy the company for $200 million. Psion was established in 1980 as a software house with a close relationship with Sinclair Research. The company developed games and other software for the ZX81 and ZX Spectrum home computers, released under the Sinclair/Psion brand. Psion's games for the ZX Spectrum included Chess, Chequered Flag, Flight Simulation and the Horace series. Early software releases for the ZX Spectrum included titles such as VU-Calc, VU-File and VU-3D along with dozens of other titles. The company name is an acronym standing for "Potter Scientific Instruments", after the company's founder, David Potter. The acronym PSI was already in use elsewhere in the world so "ON" was added to make the name PSION unique. David Potter remained managing director until 1999 and was chairman of the company until late 2009. In early 1983, Sinclair approached Psion regarding the development of a suite of office applications for the forthcoming Sinclair QL personal computer. Psion were already working on a project in this area and the QL was launched in 1984, bundled with Quill, Archive, Abacus and Easel; respectively a word processor, database, spreadsheet and business graphics application. These were later ported to MS-DOS, collectively called PC-Four, or Xchange in an enhanced version. 1984 also marked Psion's first foray into hardware; the Psion Organiser, an early handheld computer, in appearance resembling a pocket calculator with an alphanumeric keyboard. In 1986, the vastly improved Psion Organiser II was released, and was assembled by Speedboard Assembly Services. Its success led the company into a decade long period of "Psion" Computer and operating system development. It included a simple-to-use database programming language, OPL, which sparked a large independent software market. In 1987, Psion began development of its "SIBO" ("SIxteen Bit Organiser") family of devices and its own new multitasking operating system called EPOC to run its third generation product, Laptops (MC), industrial handhelds (HC and Workabout) and PDA (Series 3) products. It is often rumoured that EPOC stands for "Electronic Piece Of Cheese" however Colly Myers, who was Symbian's CEO from founding until 2002, said in an interview that it stood for 'epoch' and nothing more. This development effort produced the clamshell QWERTY-based Psion Series 3 palmtops (1993–98), which sold in the hundreds of thousands, and the Psion MC-series laptops, which sold poorly compared to the DOS-based laptops of the era. A second effort, dubbed Project Protea, produced the Psion Series 5 for sale in 1997, a completely new product from the 32-bit hardware upwards through the OS, UI, and applications. It is still remembered for its high quality keyboard which, despite its size, allowed for touch-typing. However, the new feel of the product, and the removal of certain familiar quirks, alienated loyal Series 3 users, who tended to stick with their PDAs rather than upgrade. In 1999, Psion released the Psion Series 7, which was much like a larger version of the Series 5, but with a double-size VGA-resolution screen that featured 256 colours (the Series 5 had a half-VGA screen with 16 grey shades). It was followed by the very similar Psion netBook. Psion was being challenged by the arrival of cheaper PDAs such as the Palm Pilot, and PocketPCs running Microsoft's Windows CE, and in 2003, Psion released a Netbook Pro running Windows CE .NET 4.2 instead of EPOC. The 32-bit EPOC developed by Project Protea resulted in the eventual formation of Symbian Ltd. in June 1998 in conjunction with Nokia, Ericsson and Motorola. The OS was renamed the Symbian Operating System and was envisioned as the base for a new range of smartphones. Psion gave 130 key staff to the new company and retained a 31% shareholding in the spun-out business. The Symbian operating system as of 2007[update] powered around 125 million mobile phones such as the Sony Ericsson P900 series. The development of new and updated products by Psion slowed after the Symbian spin-off. Other products failed or had limited success — a Psion Siemens' GSM device, a Series 5 based STB, the Wavefinder DAB radio, an attempt to add Dragon's speech recognition software to a PDA, Ericsson cancelled a Series 5MX derived smartphone project in 2001. Psion had sold its sole manufacturing plant in 1999 and started to withdraw from its PDA markets in late 2001, shedding 250 of 1,200 staff and writing-off £40 million. The PDA, which was once a niche market, had become a global horizontal marketplace where it was difficult for Psion to compete. The final blow for Psion's Organiser and PDA business came in January 2001 when Motorola pulled out of a joint project with Psion, Samsung, and Parthus, to create "Odin", an ARM-based PDA-phone. In 2000, Psion acquired Teklogix in Canada for £240 million, and merged its business-to-business division, Psion Enterprise, with the newly acquired company. Teklogix was re-branded Psion Teklogix. This division now forms the core of Psion Plc's business. In 2002, Psion created a new division called Psion Software. This business developed push email solutions for Symbian smartphones, Microsoft Exchange and Lotus Notes. This business was sold to Visto (USA) in 2003. In 2004, Psion announced its intention to dispose of the company's remaining Symbian shareholding to Nokia, as they no longer regarded it as a core part of their strategy. Psion intends to tailor and customize modular variants of its products through its online community, Ingenuity Working. Launched in March 2010, Ingenuity Working had more than 35,000 visitors per month within its first six months. In January 2011, the company refreshed its corporate identity and developed a new logo, which it describes as an icon. It claims it did this to "demonstrate its new business model in action and to signal that it is no longer a consumer products company, which was symbolized by the old Psion logo". At the same time it removed Teklogix from its operating company name to create a "clear, unifying, global identity". Psion registered the trademark NETBOOK in various territories, including European Union and U.S. Trademark 75,215,401, which was applied for on 18 December 1996 and registered by USPTO on 21 November 2000. They used this trademark for the Psion netBook product, discontinued in November 2003, and from October 2003, the NETBOOK PRO, later also discontinued. Intel started using the term netbook in March 2008 as a generic term to describe "small laptops that are designed for wireless communication and access to the Internet", believing they were "not offering a branded line of computers here" and "see no naming conflict". In response to the growing use of the term, on 23 December 2008 Psion Teklogix sent cease and desist letters to various parties including enthusiast website(s) demanding they no longer use the term "netbook". In early 2009, Intel sued Psion Teklogix (US & Canada) and Psion (UK) in the Federal Court, seeking a cancellation of the trademark and an order enjoining Psion from asserting any trademark rights in the term "netbook", a declarative judgement regarding their use of the term, attorneys' fees, costs and disbursements and "such other and further relief as the Court deems just and proper". 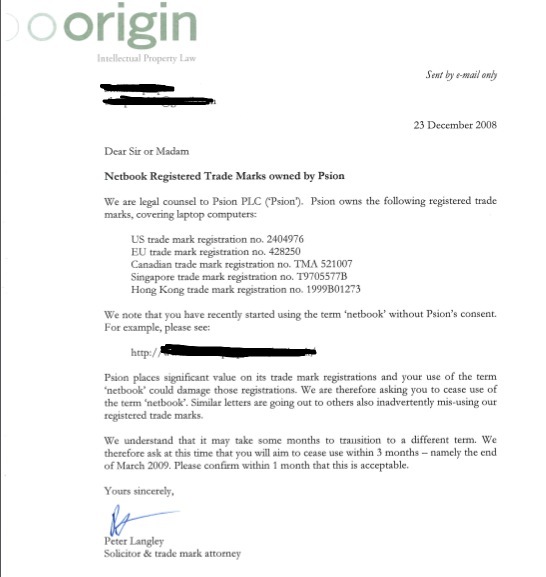 The suit was settled out of court, and on June 2, 2009 Psion announced that the company was withdrawing all of its trademark registrations for the term "Netbook" and that Psion agreed to "waive all its rights against third parties in respect of past, current or future use" of the term. Psion PLC had a lengthy, but distant, interest in Linux as an operating system on its electronic devices. In 1998, it supported the Linux7K project that had been initiated by Ed Bailey at Red Hat, which was to port Linux to its Series 5 personal computer. The project was named after the Cirrus Logic PS-7110 chip of the Series 5. Although this project was one of the earliest attempts to port Linux to a handheld computer, it did not come to fruition for Psion. The project soon transitioned to an informal open source project at Calcaria.net that kept the name Linux7K. After the project transitioned again to sourceforge.net, the project's name was changed to a more general name "PsiLinux", and more recently to "OpenPsion". The project has developed Linux kernels and filesystems for the Revo, Series 5 and 5MX, and Series 7 and netBook. In 2003–4, Psion Teklogix and its founder David Potter expressed interest in Linux as the operating system for its devices as it divested from Symbian. However, the only result of that interest was Linux as the operating system on a limited number of custom NetBook Pros designed for a hospital setting. The Embeddable Linux Kernel Subset project has produced a small subset of Linux that runs on Psion Series 3 PDAs. All these PDAs except the Psion netpad have a small keyboard, which excepting the Organiser, HC and Workabout was of the standard QWERTY layout, or a regional variation thereof. ^ Figas, Jon. "Motorola Solutions buys Psion for $200 million". Engadget. Retrieved 15 June 2012. ^ a b c d e f g Litchfield, Steve (2005) . "The History of Psion". Palmtop Magazine. UK Online. Retrieved 2008-12-27. ^ Frankal, Elliot (2005-09-04). "Ask and it shall be texted to you". The Observer. Retrieved 2008-12-27. ^ Needham, Mark (February 19, 2004). "We Remembered Psion and Wept" (PDF). PC Pro. Retrieved 2012-02-22. ^ "Psion buys Teklogix". BBC News. 2000-07-12. Retrieved 2008-12-27. ^ "Psion Launches IngenuityLive! as IngenuityWorking.com Marks Six Month Anniversary with Huge Industry Participation Rates". 2010-10-19. Archived from the original on 2013-02-01. Retrieved 2011-10-19. ^ a b "Psion Removes "Teklogix" Name and Refreshes Corporate Identity". 2011-01-31. Archived from the original on 2013-02-01. Retrieved 2011-01-31. ^ Jones, Marc Ambasna (May 11, 1999). "Opinion: Mobile Linux for Bluetooth – spanner for Microsoft?". News. UK: ZDNet. Retrieved 2007-06-17. ^ Jones, Marc Ambasna (April 23, 1999). "Mobile Linux for Psion pressures Win CE". News. UK: ZDNet. Retrieved 2007-06-17. ^ Almesberger, Werner (1999). "Linux in the pocket - The Linux-7k project". Ottawa, ON, CA: Linux Symposium. Archived from the original on 2007-07-04. Retrieved 2007-06-17. ^ Kewney, Guy (February 9, 2004). "Psion looks past Windows to Linux as Nokia buys Symbian". News Wireless. newswireless.net. Retrieved 2007-06-17. ^ Partridge, Chris (July 8, 2003). "Psion prepares the way for the one true OS". Computing. VU Net. Archived from the original on 2007-09-30. Retrieved 2007-06-17. ^ Kewney, Guy (February 2004). "What Will Become the Next Scion of Psion?". eWeek. Ziff Davis Media. Archived from the original on 2004-09-20. Retrieved 2007-06-17. ^ Glover, Tony (May 23, 2004). "NHS deal with Psion heralds move away from Windows". The Business Online. Archived from the original on 2004-06-06. Retrieved 2007-06-17. OpenPsion: A project to port linux to Psion Handhelds!